Until now, the only beer that Holy Mountain Brewing Company has released in bottles is The Third Nail, which was a special release for the Pine Box’s 3rd anniversary. This weekend, the brewery will release two beers that have frequently been pouring at the taproom: Ceremony and Silent Sun. The bottles will be available when the brewery opens on Saturday, June 13 at 12pm. Both beers will be released in 750ml bottles, with the price being $15 for Silent Sun and $12 for Ceremony. The limit is 6 bottles per person, and there will be about 300 bottles total of each beer available. To celebrate the occasion, the taproom will also be pouring Apricot Table, the first in a series of American Table Sours. This batch of Apricot Table was aged in oak barrels with a wild culture, then racked into an oak wine puncheon on top of apricots and allowed to age with additional brettanomyces. Holy Mountain’s Table Sours are intended to be easy­ drinking, moderate alcohol sours drawing inspiration from the German Berliner Weisse tradition of lacto and brett fermentations. Personally, I’m quite excited to see Ceremony in bottles. It has become my go-to beer when visiting the Holy Mountain taproom. This assertively-hopped farmhouse pale ale is fermented 100% with brettanomyces and weighs in at 6% ABV. It’s fruity, a bit funky and nice and dry. Perfect for a sunny afternoon. (Seattle, WA) Holy Mountain Brewing Company, located in Seattle’s Interbay neighborhood, is proud to announce the first release in bottles of two beers. 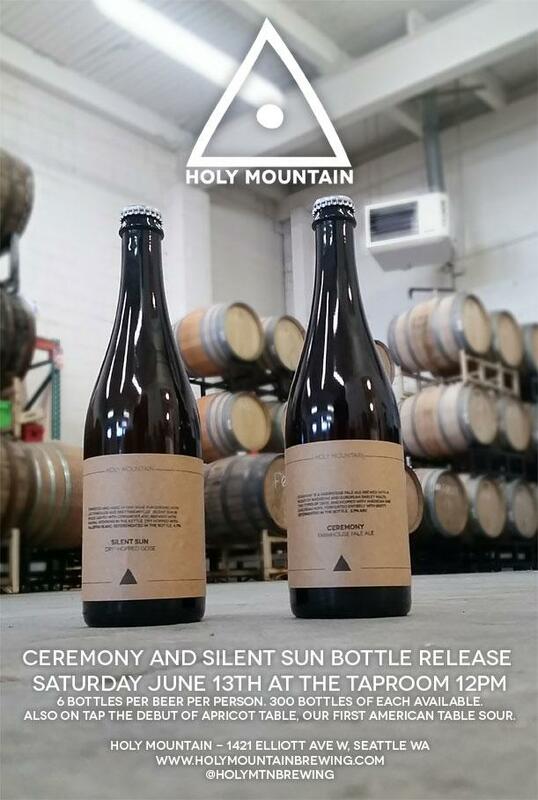 Ceremony and Silent Sun will both be released as taproom -only limited bottlings available Saturday, June 13th starting at 12pm at the Holy Mountain taproom located at 1421 Elliott Ave W in Seattle. Silent Sun is a barrel fermented and aged Gose dry hopped with Hallertau Blanc. Brewed with wheat and pilsner malts, as well as coriander and salt, this Gose was fermented entirely with lactobacillus and brettanomyces in oak puncheons. It’s was also refermented in the bottle with two strains of brett. Ceremony is a farmhouse pale ale brewed with oats, 100% brettanomyces fermented, and hopped with Goldings and Citra. It is also refermented in the bottle with brett. The total bottle count for both releases is approximately 300 bottles each, and both will only be available at the Holy Mountain taproom. Bottle limits of 6 bottles per beer per person. A special new beer will be tapped to celebrate the occasion. Apricot Table, the first in a series of American Table Sours that will be released starting this summer. This batch of Apricot Table was aged in oak barrels with a wild culture, then racked into an oak wine puncheon on top of apricots and allowed to age with additional brettanomyces. Holy Mountain’s Table Sours are intended to be easy­drinking, moderate alcohol sours drawing inspiration from the German berliner-­weisse tradition of lacto and brett fermentations. Das Brat Wagen will be on hand Saturday the 13th serving up Bratwurst sausages. The Holy Mountain Brewing Company taproom is located at 1421 Elliott Ave W in Seattle’s Interbay neighborhood. Featuring 12 taps of Holy Mountain’s ales and lagers, the taproom is open Monday, Wednesday, and Thursday 3­-9, Friday 3­-10, Saturday 12­-10, and Sunday 12-­9. The taproom is closed Tuesdays. Food trucks every Saturday. 21+ except to pick up growlers, no pets. The taproom has parking on the west side of the building, which can be accessed from the alley off of W Galer St under the Magnolia overpass, or W Lee St, next to the Dog Lounge. There is also access from Elliott Ave, including ADA access. Outside food is welcome.